iChat Server was sooooo easy to configure. 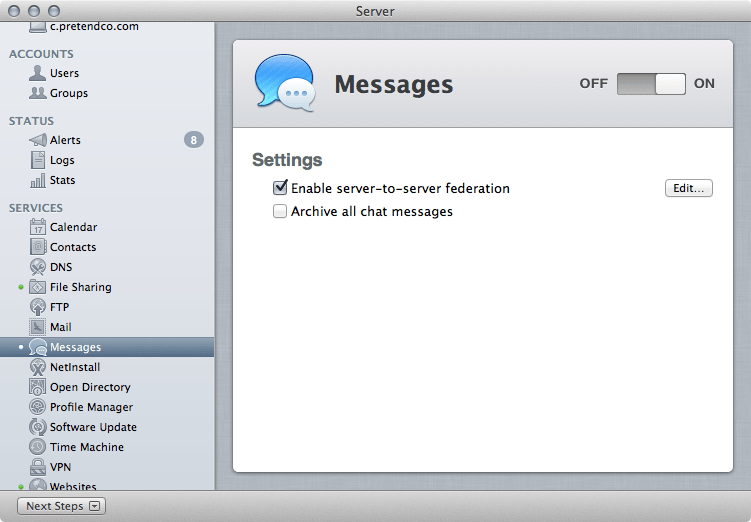 iChat Server is now Messages Server. Both use the open source jabber project as their back-end code base. Lucky us, all Apple did in the latest iteration is change the name of the service in the Server app, leaving the command line effectively untouched. The paths to things serverish have changed. The jabberd binary is now at /Applications/Server.app/Contents/ServerRoot/private/var/jabberd and the autobuddy binary is at /Applications/Server.app/Contents/ServerRoot/usr/bin/jabber_autobuddy. Given the importance of having multiple binaries that do the same thing, another jabberd binary is also stored at /Applications/Server.app/Contents/ServerRoot/usr/libexec/jabberd. Note that the man page says it’s in /etc. But I digress. Setting up the Messages service is simple. 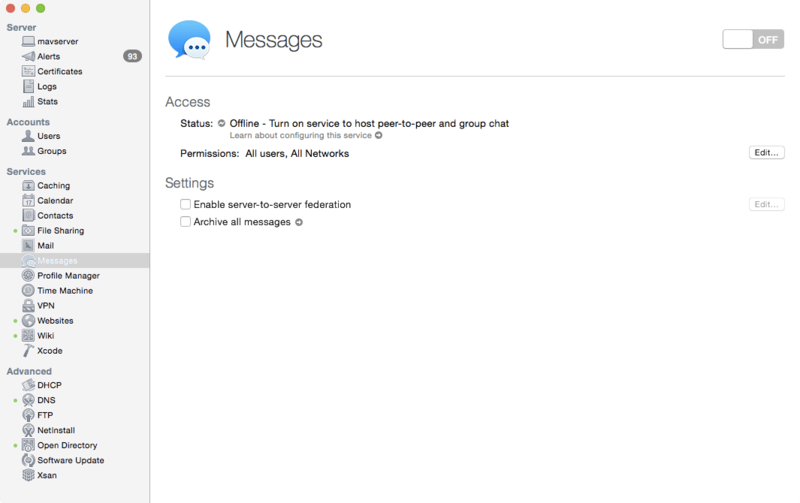 Open the Server app and click on Messages in the Server app sidebar. 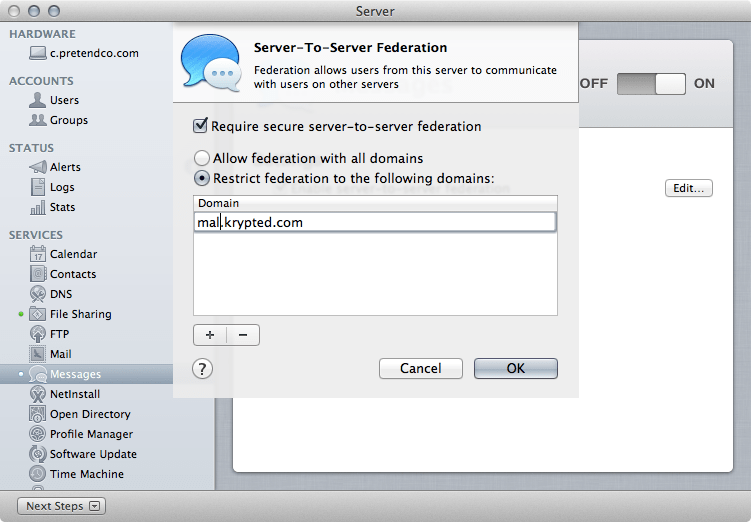 Once open, click on the checkbox for “Enable server-to-server federation” if you have multiple iChat, er, I mean, Messages servers and then click on the checkbox for “Archive all chat messages” if you’d like transcripts of all Messages sessions that route through the server to be saved on the server. 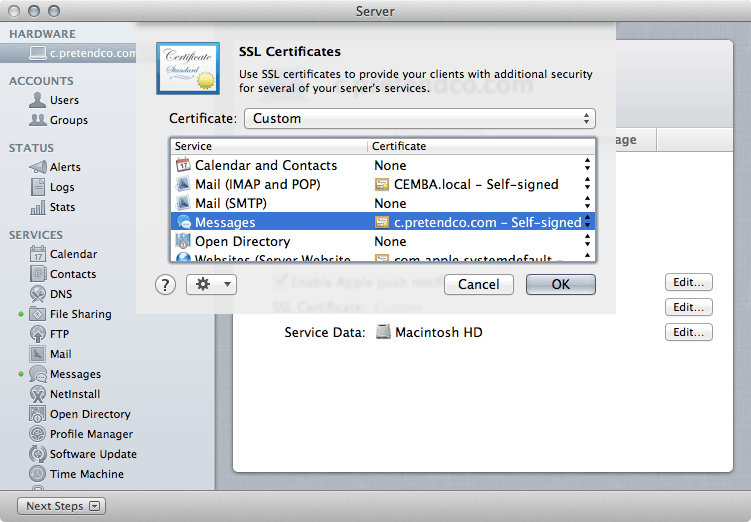 You should use an SSL certificate with the Messages service. If enabling federation so you can have multiple Messages servers, you have to. Before enabling the service, click on the name of the server in the sidebar of Server app and then click on the Settings tab. From here, click on Edit for the SSL Certificate (which should be plural btw) entry to bring up a screen to select SSL Certificates. At the SSL Certificates screen (here it’s plural! 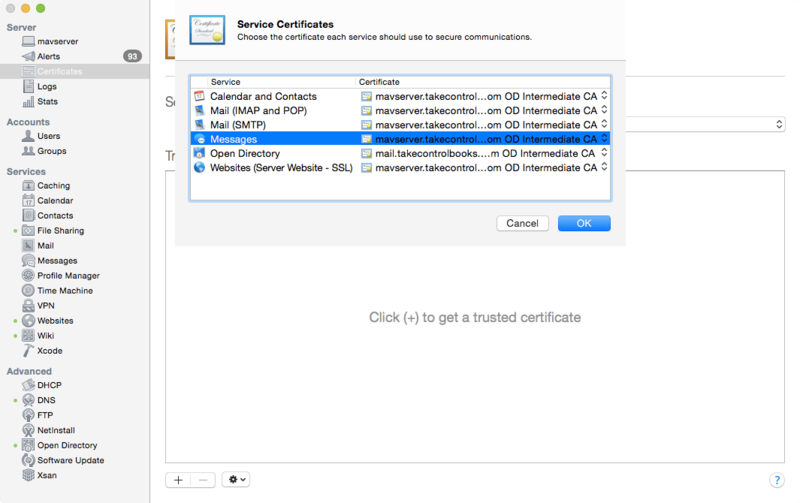 ), select the certificate the Messages service should use from the available list supplied beside that entry and click on the OK button. 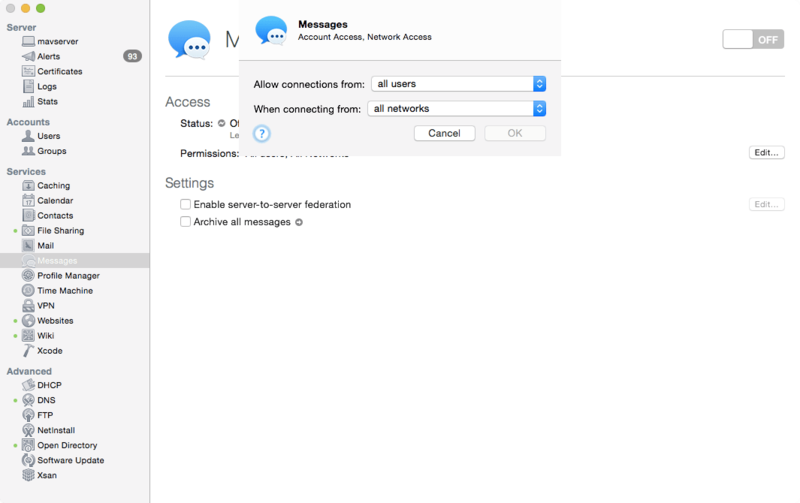 If you need to setup federation, click back on the Messages service in the sidebar of Server app and then click on the Edit button. Then, click on the checkbox for Require server-to-server federation (making sure each server has the other’s SSL certificate installed) and then choose whether to allow any server to federate with yours or to restrict which servers are allowed. I have always restricted unless I was specifically setting up a server I wanted to be public (like public as in everyone in the world can federate to it, including the gorram reavers that want to wear your skin). To restrict the service, then provide a list of each server address capable of communicating with your server. Once all the servers are entered, click the OK button. Obviously, if you only have one server, you can skip that. Once the settings are as you wish them to be, click on the ON/OFF switch to light up the service. To see the status of the service, once started, use the fullstatus option with serveradmin followed by the jabber indicator: sudo serveradmin fullstatus jabber The output includes whether the service is running, the location of jabber log files, the name of the server as well as the time the service was started, as can be seen here: jabber:state = "RUNNING" jabber:roomsState = "RUNNING" jabber:logPaths:PROXY_LOG = "/private/var/jabberd/log/proxy65.log" jabber:logPaths:MUC_STD_LOG = "/var/log/system.log" jabber:logPaths:JABBER_LOG = "/var/log/system.log" jabber:proxyState = "RUNNING" jabber:currentConnections = "32" jabber:currentConnectionsPort1 = "32" jabber:currentConnectionsPort2 = "0" jabber:pluginVersion = "10.8.177" jabber:servicePortsAreRestricted = "NO" jabber:servicePortsRestrictionInfo = _empty_array jabber:hostsCommaDelimitedString = "kaylee.pretendco.com" jabber:hosts:_array_index:0 = "kaylee.pretendco.com" jabber:setStateVersion = 1 jabber:startedTime = "2012-08-02 02:53:26 +0000" jabber:readWriteSettingsVersion = 1 There are also a few settings not available in the Server app. One of these that can be important is the port used to communicate between the Messages client and the Messages service on the server. For example, to customize this to 8080, use serveradmin followed by settings and then jabber:jabberdClientPortSSL = 8080, as follows: sudo serveradmin settings jabber:jabberdClientPortSSL = 8080 To change the location of the saved Messages transcripts (here, we’ll set it to /Volumes/Pegasus/Book: sudo serveradmin settings jabber:savedChatsLocation = "/Volumes/Pegasus/Book" To see a full listing of the options, just run settings with the jabber service: sudo serveradmin settings jabber The output lists each setting configurable jabber:s2sRestrictDomains = no jabber:authLevel = "STANDARD" jabber:savedChatsLocation = "/Library/Server/Messages/Data/message_archives" jabber:sslKeyFile = "" jabber:enableXMPP = yes jabber:initialized = yes jabber:jabberdClientPortSSL = 5223 jabber:sslCAFile = "" jabber:requireSecureS2S = no jabber:savedChatsArchiveInterval = 7 jabber:hostsCommaDelimitedString = "zoe.pretendco.com" jabber:jabberdDatabasePath = "/Library/Server/Messages/Data/sqlite/jabberd2.db" jabber:jabberdS2SPort = 5269 jabber:hosts:_array_index:0 = "zoe.pretendco.com" jabber:jabberdClientPortTLS = 5222 jabber:enableSavedChats = no To stop the service: sudo serveradmin stop jabber And to start it back up: sudo serveradmin start jabber It’s also worth noting something that’s completely missing in this whole thing: Apple Push Notifications… Why is that important? Well, you use the Messages application to communicate not only with Mac OS X and other jabber clients, but you can also use Messages to send text messages. Given that there’s nothing in the server that has anything to do with texts, push or anything of the sort, it’s worth noting that these messages don’t route through the server and therefore still require an iCloud account. Not a huge deal, but worth mentioning that Messages server doesn’t have the same updates built into the Messages app. Because messages don’t traverse the server, there’s no transcripts. The Elephant in the Room: The New Lion OS X is out, now what? There are a lot of differences to contend with between Lion and Snow Leopard. Now with the new Mountain Lion update, what changes can we expect to see? We discuss the differences in advanced services, GUI simplicity, and Apache management GUI’s. We help you understand the updates in the new OS and make the transition easier. We go over the new updates of Lion over the Snow Leopard server. Setting solid foundations: To truly grasp the power of Lion, you need to set up solid foundations. We go over minimum requirements for internet DNS, and tackle router tricks. We discuss open directory and what it was used for. Mobile Device Management 101: Apple’s IPCU/Apple Configurator: Mobile Device Management is vital to businesses, large or small. We have an extensive overview of profile manager and how you can use mobile device management on OS X. For those still using Snow Leopard, we go over your options and discuss the possibility of using third parties as a solution. DNS, Ahh, run away, run away: In this session, we tackle DNS and break it down and show how simple it is to work with. We go over how DNS works and cover different components such as internet DNS and internal DNS. Administering a Server with just Server.app: We show you how to use server.app and control administrative programs. For the services, we go over Address Book, iCal, iChat, and Mail. : Web Admin on Lion Server versus Snow Leopard is covered, dealing with the differences and how to use each system effectively. On Lion server, we cover using FTP without a GUI. Going old school, using the old tools: After getting used to Snow Leopard we go over the major differences between Snow and Lion and how you can handle the transition. We go over server admin and what is still left in the program and why it has been left. Deployment Part I: Tools & Concepts: In tools and concepts we learn that there aren’t stark differences between Lion server and Snow Leopard. NetBoot, NetRestore and third party tools are covered; we talk about how NetBoot works and what the differences between NetBoot and NetRestore are. Along with this we cover Network configuration requirements and using software update server. Deployment Part II: DeployStudio: DeployStudio is covered in-depth; we cover creation techniques and management techniques. Overall, this represents a nice, fast way to update your skills to allow for managing Lion Server and to get up to speed with those new to the platform. One thing I like about the session list is that it goes beyond the stock server implementation and looks at DeployStudio, MDM and other important topics not purely server oriented. I hope to see you all there! So maybe you want to save all those iChats you have. 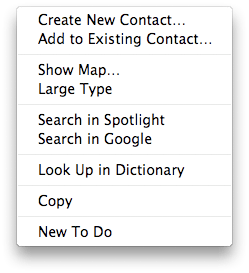 Well, open iChat, click on the iChat menu and click on Preferences. Here, click on Messages and check the box for Automatically Save Chat Transcripts and select the location. The close the Preferences dialog. That’s it.